2nd MAGENTA Meeting on 20th and 21st July in Neuchâtel, Switzerland. MAGENTA H2020 proposes a brand new technological path in thermoelectric materials research for waste-heat recovery applications. The originality of the project is based on the newly discovered thermal-to-electric energy conversion capacity of ionic-liquids and ferrofluids; i.e., colloidal dispersions of magnetic nanoparticles in ionic liquids (IL-FFs). The second MAGENTA meeting was held on 20th and 21st July in Neuchâtel, Switzerland. 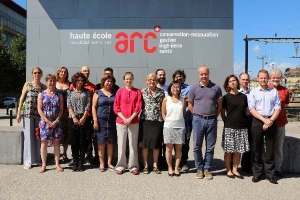 Herber Keppner and Edith Laux (HESSO) welcomed the project partners to the Haute Ecole ARC-Ingénierie. All the participants in this meeting congratulated Herber and Edith on the excellent organization of this meeting. The event was filmed by Swiss television (canal alpha).